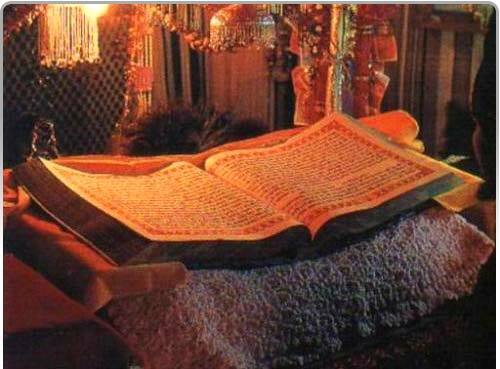 1) The Sri Guru Granth Sahib Ji, is Scripture that was written by the Guru (an Enlightened Being) during his life time. 2) Not only was the Sri Guru Granth Sahib Ji written by the current Sikh Guru of the time starting in the 1400 century. These teachings were endorsed by ALL 10 Sikh Gurus and expanded upon. 3) The 10th Sikh Guru (Sri Guru Gobind Singh Ji) in 1699 declared the Sri Guru Granth Sahib Ji to be the next Guru, written form. He said the world is in a time where there will be many fakes pretending to be a Guru to lead people a stray, and therefore declared the end of live Gurus. He declared the Sri Guru Granth Sahib Ji as the Word of God, and to be the Guru in Word (Shabad) form. He also said the Light of the previous Guru’s (Joth) … everything that would needed to merge with God, is present in the Sri Guru Granth Sahib Ji. And then Sri Guru Gobind Singh Ji himself bowed down to the Sri Guru Granth Sahib Ji to show the congregation that the Sri Guru Granth Sahib Ji is infact the next Guru. 4) The Sri Guru Granth Sahib Ji, is only 300 years old, and therefore, intact and exactly as the Guru’s recorded it for mankind. There is no question of it’s authenticity. Muslim lineages. Also, the Sri Guru Granth Sahib Ji, incorporates the various local languages of it’s time from various faiths & races. Truly written teachings for all walks of life. Other Worlds … “So many worlds beyond this world-so very many!” (Page 3 – Line 14) in declaring other lifeforms, which scientist now do believe they exist on as of the 21st century. The Creator created the entire universe, and infused His Light into it. Feed the Hungry Community Kitchens – everyone eats together regardless of cast, creed, faith or social status.